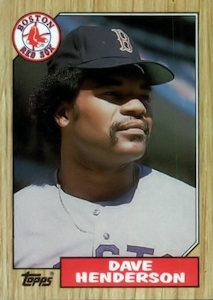 ON THIS DATE (July 18, 1987) ... After Jim Rice's ninth-inning homer brought the Red Sox into a 3-3 tie, Dave Henderson stepped to the plate in the 10th and cranked a two-run blast into the right-field seats to hand the Sox a 5-3 victory over the Oakland Athletics. Henderson, without a game-winning RBI since Game 5 of the 1986 playoffs, picked on Gene Nelson's 2-and-2 pitch and deposited it neatly into the stands. Dwight Evans, who led off with a single, trotted home in front of him, and a blissful crowd of 34,720 went home talking of the way things used to be. The Sox, for much of the game, were lulled by the offerings of Jose Rijo. By the fourth inning, Hurst had allowed seven hits and the Sox were in a 3-1 hole. The Sox finally got into the Oakland bullpen and pulled within a run in the eighth when the pinch-hitting Don Baylor cracked a sacrifice fly off Dennis Eckersley. In the ninth, Eck was only one strike away from picking up his second save in three games. He had Rice at 2-and-2 with two outs and reached back in hopes of twisting a big curve by the Sox' struggling cleanup man. He was caught looking with the bases loaded in the third and had left a total of five runners stranded before the ninth. Finally, in the 10th, Evans led off with a single and Henderson nailed Nelson for his seventh homer of the year.